Police in Baltimore County have cleared fifteen shoplifting incidents at local home improvement stores involving an organized crew of criminals, and are asking for the public’s assistance in identifying two more of the suspects. 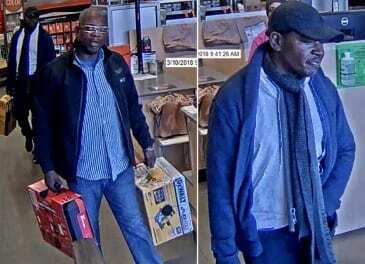 The two suspects pictured are associated with this shoplifting crew and were caught on surveillance camera taking tools from a Home Depot store in Baltimore County. Detectives are now asking for the public’s assistance in identifying these men. The suspects involved in this shoplifting crew have stolen in excess of $100,000 worth of tools, usually Dewalt or Milwaukee tool kits like those seen pictured above. While detectives have cleared fifteen cases from Baltimore County, there are at least forty documented cases involving this group of suspects spanning throughout Maryland and in Delaware. Anyone who recognizes the two unidentified suspects or has any information on these crimes or additional suspects can contact police at 410-307-2020.